"I'm on chapter 6 of Espí﻿ritu. I love the book already! The words and images are burned into my memory! Only one other book has had that effect on me (A Wrinkle in Time). It's like I'm there." "Let me say a special word of thanks to you for your book Espíritu. I just finished reading it. I found myself hooked and couldn't put them down and ended up devouring both [Esp﻿íritu and Jaime], the sign of a great book. I wish I had read your books earlier. I would recommend buying these books for yourself and others. We have our own 'female Frank Peretti' in our midst, (and I don’t say that lightly!!)." "I just finished Espíritu and I have to say the best compliment to a writer is, "I couldn't put it down!" Will start the next one soon, then pass them to my great nephew Devyn who loves to read." 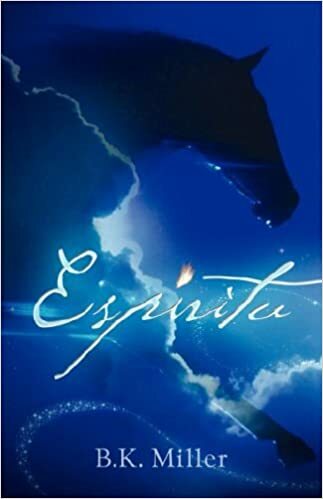 "[Espíritu] is now on my list of favorite books to read. I’m currently reading Jaime and am loving it all the way. Is there a third book in the series? I’m addicted to them now." "I am not a reader. A friend loaned me the books Espí﻿ritu andJaime. I was captured from the beginning. I couldn't stop reading. I looked for any excuse to pick them up and begin again. Little did I know I too would would fly on the back of the magical horse and experience heaven. Sara finds supernatural adventures that make us hunger for the same experience. Coming back to earth she begins the battle of fighting monster demons--jumping out and attacking her at every unexpected moment. I was scared to death! My granddaughter loves scary and suspenseful books. If you want that, too, I suggest you read B.K. Miller's books."